Petra is an ancient city in the Kingdom of Jordan famed for its unique architecture; the entire city is carved out of cliffs of rose-red rock. Petra has been named a UNESCO World Heritage Site for its universal value as part of human history and is one of the Seven Wonders of the World. If you imagine Petra as something out of a scene from Indiana Jones you won’t be wrong. In fact scenes from the movie were filmed here. Visiting Petra is a magical and rare experience that will take you back thousands of years to when it was a desert oasis along the ancient trade routes. Ancient trade caravans carrying exotic goods from Arabia and Egypt to the Mediterranean, Syria and Damascus passed through Petra. This strategic position made it a natural stop for traders crossing the harsh desert landscape. The Nabataean people made Petra their capital in approximately 312BC and controlled the trade route. They half-built and half carved their city out of rock cliffs surrounding their settlement forming a natural fortress protected by the rugged desert canyons. The Nabataean city provided a much needed rest for traders on their journey. The Nabataeans were highly advanced in many fields. Using their advanced engineering and construction skills they created the city out of nothing. They devised a complex system to control their water supply collecting water from flash floods through water conduits and from nearby springs then storing it in large cisterns. With a good water supply they were able to sustain their city which was home to about 20,000 at its peak. The Nabataean society slowly declined as trade routes were diverted from Petra preferring to go around the Arabian Peninsula by sea. 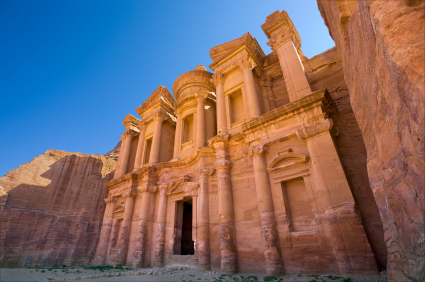 In 363AD a major earthquake hit the region destroying Petra’s water system and many buildings. The Nabataeans eventually abandoned the city. In the 2nd century AD Petra was inhabited by Romans and the last trace of human occupation was during the Crusader period. For hundreds of years Petra stood abandoned, known only to local Bedouin. The dry climate and isolated location contributed to the city’s survival earning the name “The Lost City” until being rediscovered in the 1800s. Over the next century several thousand Westerners visited Petra. In the 1900s the Kingdom of Jordan began protecting the site and excavations were undertaken to preserve Petra as part of the country’s heritage. Today Petra is Jordan’s top attraction visited by about half a million tourists each year. Visitors to Petra enter the city as ancient trades would have, through the narrow Siq, a long gorge flanked by tall, cliff walls. You can even take a donkey or camel ride through the Siq. This natural pass opens up as you enter the city of Petra and are you are faced with one of the most impressive structures, the Treasury. The Treasury (Al Khazneh) is a double storey tomb with a façade of intricate columns and a large urn carved out of the solid sandstone rock. Petra has about 3,000 structures including temples, dwellings, tombs and halls. In addition to the Nabataean structures there are Roman era statues, tombs and temples plus a Byzantine church where a brilliant floor mosaic has survived. The Obelisk Tomb is one of the large and elaborate tombs carved into the rock face. The lower level of the facade is reminiscent of a Greek temple while the upper level has Egyptian influences with four pyramid-like obelisks. The Royal Tombs are the largest necropolis complex in Petra consisting of the Urn Tomb, Corinthian Tomb, Palace Tomb and Silk Tomb. These tombs have grand decorated columns, intricately carved gates and massive burial chambers some 46 meters high and 49 meters wide. The largest structure in Petra is the Monastery (El Deir), a 50 meter wide and 45 meter tall structure which you can climb following 800 steps to get a breathtaking view across the city from the High Place of Sacrifice. Visitors can walk down the central Street of Facades flanked by tall facades of tombs carved into the red hued rock. At the end of the colonnaded street is the one building which is not carved out of the cliffs, Qasr al-Bint al-Faroun (Castle of Pharoah’s Daughter). 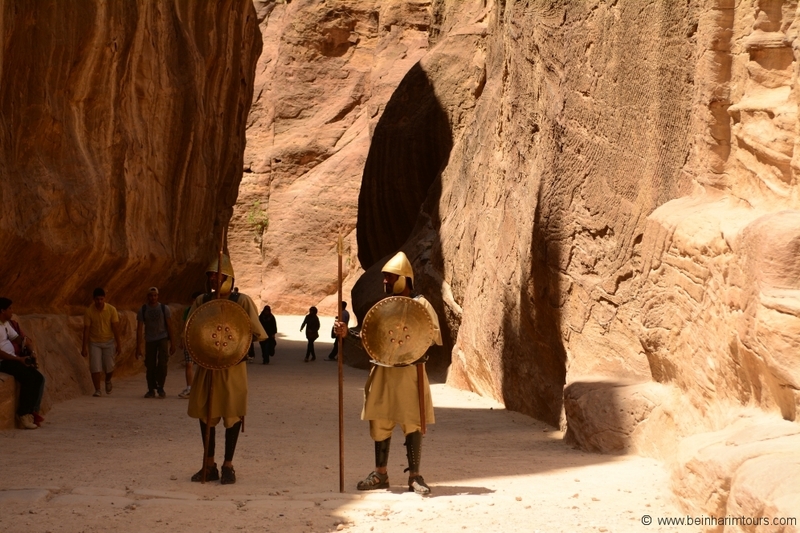 An ancient legend tells of an Egyptian Pharaoh who followed the Israelites after their exodus from Egypt and gave up the chase here deciding to settle in Petra instead. The Romans left their mark on Petra in the form of statues of Greco-Roman gods and a massive Roman amphitheatre carved out of the mountainside. Just inside the entrance to Petra is the Princess Alia Clinic Brooke Hospital for Animals which takes care of the horses, camels and donkeys which work transporting tourists in and out of the archaeological site. 4km from the main entrance to Petra is the Petra Museum where more than 600 excavated artifacts are on display. On Monday, Wednesday and Thursday nights thousands of candles are laid out on the ground between the Siq and the Treasury. The candles casting shadows on the red cliff walls creating a magical atmosphere and guests are treated to a performance of traditional Bedouin music and storytelling. Experts believe that there is still much to be discovered about Petra and that we have only seen a fraction of the original carvings which still lay hidden. As recently as 2016 a previously undiscovered monument was detected beneath the sands of Petra using satellite imagery. Reaching Petra is no longer the arduous trek through the harsh desert that ancient traders faced. Today tourists based in Israel can take a day tour to Petra from Eilat, Tel Aviv or Jerusalem. The tours last 1-4 days and can include visits to Aqaba, Jordan’s Red Sea port, Amman and other local sites. Some tours take you across the Jordan/Israeli border to Petra and back again in one day and other tours include an overnight stay in a hotel, guest house or even a Bedouin tent! The tour company takes care of border crossings, security and transportation as well as providing a knowledgeable guide. If you’re in Israel you shouldn’t pass up the rare opportunity of seeing one of the Seven Wonders of the World.